I am an over comer. I am more than a conqueror through Christ. 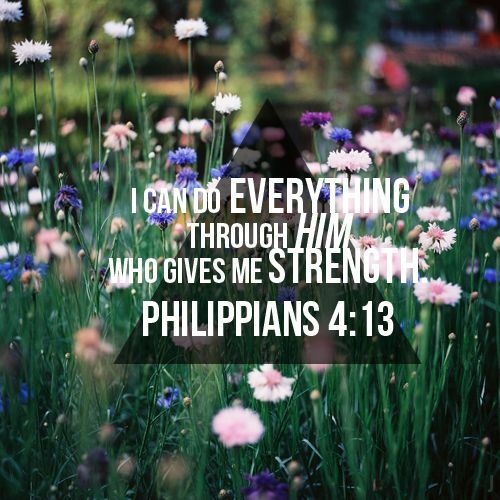 I can do ALL things through Christ who strengthens me. Today I’m speaking into existence what I believe to be true, not necessarily what is. Today I’m practicing doing what I need to do even though I’d rather nap. Today I’m being real and coming to grips with some things. It hasn’t been all sunshine and roses since my Easter Weekend experience, although I would say that it’s been a LOT better since then. When I gave birth to my son Noah almost 2 years ago, I didn’t want to admit that I fell into some serious post-pardom depression. In fact, Noah was almost one year before I actually said – ok I need some help with this. And likewise I’ve been hesitant to let it out that I’ve been feeling pretty depressed after closing out this past chapter of my life (aka losing my job). I think that’s probably because I was so happy about it – I was miserable and looking for a way out and God did just what I asked Him to do for me. But I also didn’t take into account that even though I was excited and happy about the shift, it also was a HUGE change for me. I was suddenly thrown out the world and the work “family” that I had known for 9 years! That’s practically a decade! After I got out I started pouring myself into the new work I was doing and was getting no-where. I overpromised and under delivered, ok way under delivered. I had no energy and was content to stay on the couch and watch Noah play all day. At some point I realized I was starting to feel the same way that I felt that summer Noah was born. Like everything else was going on around me but I was just left behind, in a fog, without the energy or desire to change it. It frustrated me because I felt like I was making so much progress with my counseling and to fall back down the hole? Ugh. That just added to the depression. One thing I tend to forget is that this is a daily battle. The battle against depression is won in small choices, baby steps, and almost constant reminding that feeling a little down isn’t a sign of things to come. Yesterday at my counseling appointment my therapist said something that really stuck with me. The emptiness that I feel inside is not necessarily a bad thing. That hole is actually potential. It’s the potential for good days. It’s the potential for new things and new feelings. It’s the potential for a life so much greater. And I have to remind myself to pray and ask God to fill that hole. And he is. He’s healing me one step at a time. He’s with me through every scary thing – like today when I finally admitted to my best friend that I’ve been in a depressive funk for the past few months. I didn’t want to tell her but I knew that she needed to know and that more importantly I needed to admit that. Every day I’m one step closer.